Raumfahrt+Astronomie-Blog von CENAP - Blog: Raumfahrt - ISRO and CNES will work together to send rovers to the Moon, Mars and other planets. In picture: Prime Minister Narendra Modi and French President Emmanuel Macron. PTI file photo. The Indian Space Research Organization (ISRO) and its French counterpart, the Centre national d'études spatiales (CNES) will work together to send rovers to the Moon, Mars and other planets. 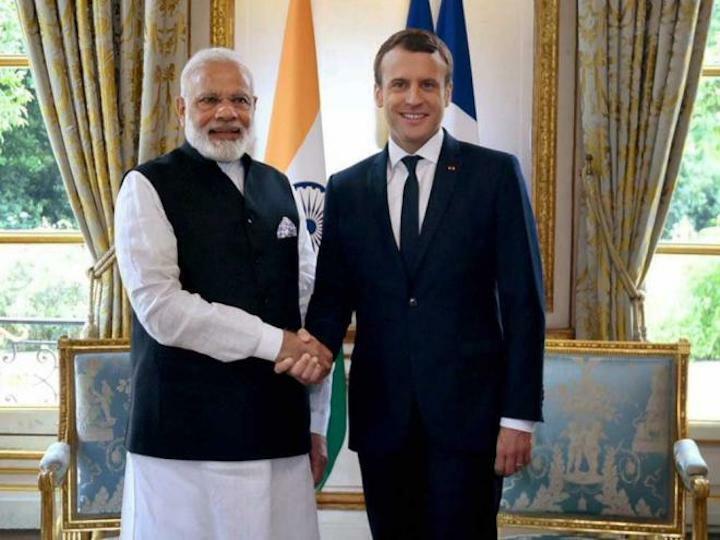 India and France on Saturday came out with the Joint Vision for Space Cooperation after a meeting between Prime Minister Narendra Modi and French President Emmanuel Macron. The ISRO and CNES will work together on autonomous navigation of rovers in the Moon, Mars and other planets and on aero-braking technologies for planetary exploration. They also agreed to work together for modelling of atmospheres of Mars and Venus and for inflatable systems for exploring Venus. Both sides will be able to embark on complex, high-technology space science and planetary exploration missions in future. The Joint Vision for Space Cooperation was issued after the Modi-Macron meet at Hyderabad House in New Delhi. The CNES is likely to provide support to ISRO particularly for the navigation of moon rovers. The modelling of Mars and Venus atmospheres will be done with support from Laboratoire de meteorologic dynamique of the Centre National de la Recherche Scientifique of France. The CNES may be involved in the defining scientific goals and preparatory studies of the future planetary missions of ISRO, and both agencies will study the possibility of embarking French science instruments on board Indian interplanetary missions, the two governments agreed on Saturday. They also agreed that the ISRO and CNES will work together to protect and monitor the assets of the two nations in land and sea, especially when it comes to the use of satellites for maritime surveillance. The agencies also agreed to cooperate to protect their respective space-based assets, by sharing infrastructure and information regarding space events. India and France will also develop a wider dialogue on space situational awareness. They agreed to cooperate in the remote-sensing of Earth using satellites, including the joint development of advanced instruments and joint missions to study weather and climate and in the sharing of data, including the direct receptions from each other's Earth observation missions meant for Meteorology, Oceanography, Resource inventory and Cartography. The two countries will also share their expertise in data analysis, including algorithm development and modelling, to derive useful information for the benefit of humanity, according to the joint vision for India-France space cooperation issued on Saturday.